Boat Rentals for the Weekend Bass Warrior! Let’s get straight to the point about boat rentals. Renting a boat for bass fishing is a great option for those of us who have sold our boats in these downward financial times in order to get some groceries on the table! You know I am right because we have seen many used bass boats for sale in the front yards of every community. That’s life. It just happens. Many marinas and businesses around popular bass fishing lakes offer boats for rent. Most of these boats will be flat bottom and smaller than what you are accustomed to using. So what!...be flexible...adjust...and carry on. 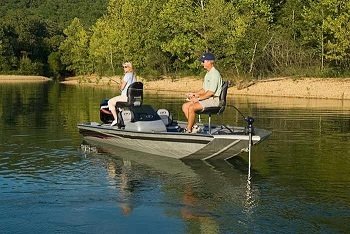 On the other hand, some places around Lake Fork, Texas will rent 15 ft. bass boats and up to 20 ft. pontoon boats. Whatever suits you and your budget. One of those places is J & J Marine. When my fishing buddy and I rented boats, we made sure we came prepared and always had a great time on the lakes. This is what you will need if you rent a small flat bottom boat. A good trolling motor to get you around the lake in a reasonable amount of time. A good marine battery to power the trolling motor. A battery charger to charge the battery before you go out on the lake. And...ahem...uh...don’t forget your fishing gear and your cooler full of anything non-alcoholic! Hey!..It ain’t a bad deal really. And be sure to clean all the trash out of the boat when you turn it back in ok. Another link for renting bass boats is American Watercraft Rentals.